[How To] Enable Ubuntu's Global Menu in Xubuntu 11.10 - OMG! Ubuntu! Xubuntu 11.10 users can now add Ubuntu’s “App Menu” plugin to their desktop set-ups. 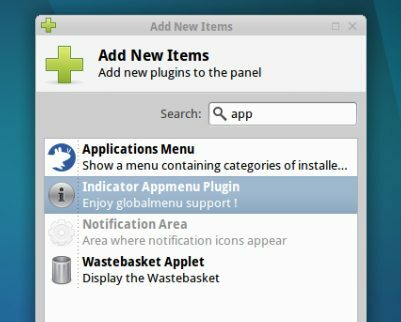 A new package by XFCE user AaronLewis89 enables the Ubuntu App Menu (also known as a ‘global menu’) to work under the XFCE desktop environment. To enable the app menu to run under Xubuntu you’ll first need to install a few packages. First up are the ‘dependencies’ – the packages that the app menu requires in order to run. Click on the button below for these to open in the Ubuntu Software Centre. Next we need to download and install the ‘app menu’ plugin itself. Aaron provides this as an easy-to-install .deb package for Ubuntu 11.10 users. Let the package download, then double-click on it to install it. Once everything has successfully installed you’ll need to add the plugin to the top XFCE panel. Depending on your screen width you may wish to move the ‘Window List’ plugin from the top menu and place it elsewhere.